For our honeymoon, we had the opportunity to stay at the Sofitel Bora Bora Private Island Resort. As part of the package, we received breakfast included each morning which was a perfect way to start each day. We stayed on the private island (motu), so we frequently dined at the Sofitel Private Island Manu Tuki Restaurant. We loved this venue because it had breathtaking panoramic views of the lagoon and faced the main island. The restaurant served a buffet style breakfast from 6:30 to 10 am and lunch between 12 pm to 5 pm. Bora Bora is located in French Polynesia, and the culture and food reflect the French influence. We looked forward to waking up each morning and taking a short walk up to Manu Tuki for a breakfast that satisfied any and every craving you might have. We were always greeted with a smile from the staff and a cheery “bonjour!” As we sat down, we were immediately given a basket filled with flakey croissants and mini baguettes. I am a huge fan of French viennoiserie style pastries, so I was in heaven! The breakfast offerings included fresh juices (mango, papaya, pineapple, grapefruit, orange), smoked fish (swordfish being my favorite), various artisan cured meats, and gourmet cheeses. There are also made to order omelet’s, fresh fruit, yogurt, pannacotta, pot de crème, freshly baked loaves of bread, brioche and cereal. The lunch selections consisted of burgers, fish sandwiches and French Polynesian dishes (poke or ceviche style fish dishes, curries, fresh fish plates, seafood salads). I fell in love with a dish called “Poisson Cru,” a Tahitian style raw fish salad made with chunks of yellowfin or ahi tuna, fresh lime and lemon juice, chopped tomatoes, onions, cucumbers and carrots, and marinated in coconut milk and served with a side of rice. My husband and I learned how to make this dish on an excursion in Moorea, and I have been a fan ever since. The simplicity and freshness of this dish make it craveable. I believe I ordered this dish at least every other day! As I became hooked on Tahiti’s version of ceviche, my husband often ordered the “Bora fish burger” from Manu Tuki for lunch, and I must admit, it tasted amazing! There are two dinner options at the Hotel Sofitel Bora Bora Marara Beach and Private Island. The Manu Tuki serves a specially designed fixed menu dinner once a week at the motu. On the main island, you can take a complimentary small boat shuttle, which takes a quick 5 to 10-minute ride provided by the Sofitel Hotel to the Marahara Beachside. There is a restaurant on the main island called Latitude 16 Degrees. This restaurant offers a more fine dining experience, overlooking the lagoon with a terrace. The menu is created by Head Chef Sebastien Schipman, and features international cuisine, theme nights, and a traditional Tahitian oven. As we began to interact with the locals and hotel staff each day, we learned a few important Tahitian words such as “ia orana” for “hello”, “Maeva” for “welcome” and the most important saying “maruru” for “thank you”. We quickly picked up the various sayings and were communicating with others as often as possible. We were so thankful for the hospitality that the hotel staff and locals living on the luxurious Bora Bora Island had shown us during our stay. Quick Tip – Pick up a free paper “Map of Bora Bora” when you land at the Bora Bora airport. This map details where lodging, car rental, activities, shopping, and restaurants can be found on the island. 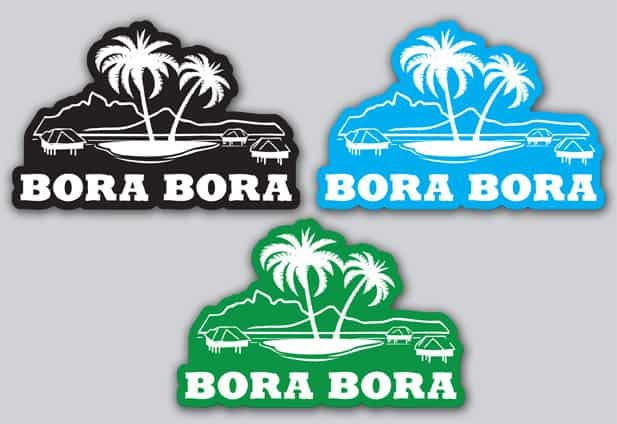 Next articleWhere is Bora Bora? We just purchased your book from Amazon which took us to your site – great tips and info! We will be going to the Sofitel Private Island this year for 10 days starting July 28 – really looking forward to our first trip to Bora Bora! Anything we should do specifically while we are on the Private Island? I also read that each room has snorkeling gear for use at no extra charge – was this the case when you both visited? Thanks a bunch! Hi Paul, thanks for buying our book! You’re going to have a great time at the Sofitel, we always enjoy our stay there. There is a main activity area where you can check out kayaks, snorkel gear, stand up paddle boards, etc.. There’s no charge. Have you seen our YouTube page with our videos from the Sofitel? Hey if you wouldn’t mind. Could you leave us some positive feedback on Amazon? We would greatly appreciate it! Someone gave us 1 star and unfortunately its the only rating you see when looking at our ebook on Amazon. Hi Jason – really appreciate the reply. I just left the well deserved 5 star feedback, again great info and we will use it while we are there. We might have seen one of your videos on youtube, not sure – we will look tonight. It is exciting and expensive, but looks romantic and we are looking forward to it for our 16th year Anniversary. Are there any bungalows at the private island that have good sunset views and did you find the water deep enough with an over water bungalow to dive off? From the looks of it, some appear to be fairly shallow. They haven’t assigned us a bungalow number yet (not sure why), but I asked for a sunset view and water deep enough to dive off the over water bungalow. Unfortunately, there are no bungalows with a sunset view. But honestly not a big deal, the bungalows are facing east and have a great sunrise. For sunset there is a look out on the top of the private island, do the Champagne sunset toast and you’ll be golden. As for the flights, they range so much. Keep an eye out on Air Tahiti Nui Airlines, every now and again they run a special. Good luck!